Annual membership meetings of county Farm Bureaus are now in full swing across the state. These meetings have some required business that includes election of officers and directors and discussion and approval of resolutions (legislative stances). While all counties share the same uniformity of required business, the other parts of the meeting can vary considerably from county to county. They include entertainment, auctions, tours, and taste testing contests; and there may be others that I am not aware of. So far this year, Elvis seems to be popular. An Elvis impersonator entertained at two counties in the Southeast district and one is scheduled later this month in the central district. I always enjoy the tours. The tours are available when a county Farm Bureau holds their meeting at a farm or agribusiness. One tour that I especially remember was in Orange County at Battlefield Farms in 2008. Battlefield Farms is a large scale horticulture business with 30 acres of covered production and 20 acres of outdoor production. At that meeting, each attendee received a large potted chrysanthemum to take home. I am reminded of that every fall because I planted mine in front of my house and it has grown to a large size with beautiful blooms. Appomattox has a pie contest for apple, pumpkin, and sweet potato. Winners are announced at the end of the meeting and receive cash prizes. The members enjoy the auctions, especially since they benefit the Virginia Ag in the Classroom Foundation. The auction last night at the Orange County meeting topped all that I have seen. It brought in $1,725. Some of the items they sold were bird feeders, toy tractors, grass seed, home canned goods, and a local artist print. The local artist framed print usually sells in the $200 range and did again this year. But the one item that really took the cake, was a cake! 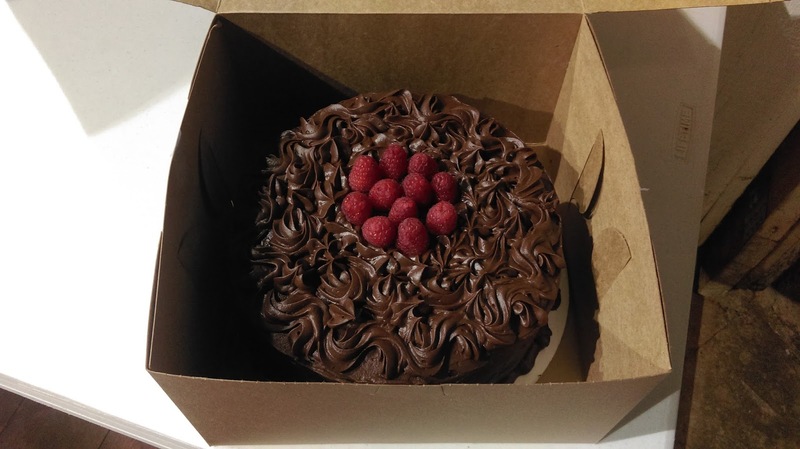 It was a triple chocolate chunk cake with Bavarian cream filling and topped with fresh raspberries, and was homemade by a member. It sold for $260, which was then donated back to be resold. It sold the second time for $250, bringing it to a grand total of $510. So you never know what you will encounter at a county Farm Bureau meeting, but you can count on having a good time. I encourage you to attend your county’s meeting this year if they have not already met yet. Love the story about the cake! The fact it was donated back and raised additional dollars just speaks to the culture of this organization and our members.